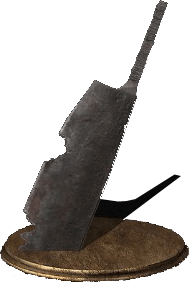 Butcher Knife is a Weapon in Dark Souls 3. Sharpening the blade increases HP restored with each successful hit. Cannot be Infused but can be Buffed using its Weapon Art. Light attacks restore 2 HP. Heavy attacks restore 10 HP. Fully charged heavy attacks restore 19 HP. HP restoration is the same whether wielding the Butcher Knife with 1 or 2 hands. Any hit will proc the healing effect whether it deal damage or not, for example staggers. Has relatively low base damage compared to most axes, but has excellent scaling in Strength and is tied with the Man Serpent Hatchet for having the highest range out of all the axes. This weapon is really cool and it will work in PvE, but the healing is pretty unnoticeable, and the Weapon Art makes it only slightly less terrible. The damage is mediocre, but it will do. In PvP this thing is AWFUL. It has no good moves because they are all easy as hell to parry. Overall, use it if you want, but avoid if you&apos;re doing anything serious. I created a character strictly for pve health regen using this knife, the etheral oak shield, sun princess ring, pontiff&apos;s left eye and right eye and your good to go. But avoid pvp like the plague as you will most certainly got parried. This is one of the best PVE weapons out there. weapon art is really useful. I guess the weapon is most useful if you want to farm for souls/items while wearing the mimic chest to counter the heal drain and you don&apos;t want to invest that many points into faith to counter it with miracles. Overrated weapon. Overall damage is so low that even an A in strength scaling doesn&apos;t save it. Scaling isn&apos;t everything people. Ok, why is it i see this so damn much when i invade low lvl? After seeing it so much, I thought "huh, guess ill see what all the hype is about", so i go pick it up and im like ?????????. It can&apos;t be infused or buffed, it has a str req of 24 (on par with some ugs!?) and it doesn&apos;t even hit that hard. Sure, it has an a scaling in str, but im seeing this low lvl were they probably only have the min req. My only theory is that this is kinda the noob trap of ds3, since i bet not having to worry about infusions or buffs is quite tempting to a new player. Also the "health every hit" thing probably sounds way better than it is to a newbie. Thats it lol. I&apos;m just super confused as to why i see this so damn much. Cant&apos;t be infused or buffed and doesn&apos;t do much damage even at +10. Why? Other than healing. Sure it can&apos;t compete with the heavy hitters like ugs, great maces and axes in terms of damage but considering how early you can find it, its damage, speed, scaling and weapon art and how easy it is to use for new players... I&apos;d say this is probably the best str weapon in the game until you reach a point where you can find a top tier str weapon and you stats can afford it which is probably during the second half part of the game. Only negative is that you can&apos;t buff it with elemental damage.. and of course it&apos;s strictly a str weapon.. no other build should use it. I have this on a cosplay character of pudge from dota 2...lol...cause even those who are beyond fearing the Reaper, fear the Butcher. I feel like its a little past the point where just sharpening it is enough, but what do I know? if you offhand this, will you get hp regen with each hit from your main weapon? Currently running this for a 40/10 STR/DEX build (just to see if thay build is even goddamn feseable). The issue with high STR builds is finding good speedy options that scale well with your build. This weapon fills that niche beautifully. Granted, it&apos;s not perfect. Health regen is better forgotten, can&apos;t be infused or buffed. But it&apos;s attack range, moveset versatility, attack speed, solid damage and low stamina drain speed make this a great choice. Think of it a bit like a speedy, pure strength equivalent of an Executioner Greatsword (another much maligned, awesome weapon). Does it stack with Pontiff Left Eye? Did this get a buff in the latest patch? Quick question, does anyone know a good fashion souls that would go with the butcher knife? Preferably with armor?